Rostra is pleased to announce the availability of our all-new SoftTouch™ Navigation Interface System for late model General Motors vehicles including the artfully redesigned 2014-2015 Chevrolet Silverado and GMC Sierra trucks, as well as other popular passenger vehicles like the Chevrolet Impala and Buick Regal. Designed for use with vehicles equipped with a factory-installed 4.2" or 8” LCD screen and IntelliLink or MyLink systems, part number 250-7620 seamlessly integrates the advanced iGo Primo mapping and navigation suite into the vehicle’s factory radio and touch screen system - all while allowing your vehicle to retain all of its original on-screen functions and controls. Although the factory-installed 4.2" LCD screens in the vehicles listed below are not touch-based, part number 250-7620 includes a clear touch panel digitizer overlay meant to be installed in front of the LCD screen to provide users with the ability to interact with the navigation system. While this digitizer does not allow the driver to touch the screen to select options when viewing the factory infotainment screen, the panel is completely transparent when not being used yet ready for input once the navigation system is launched. * For use with vehicles equipped with 8" LCD screen only. 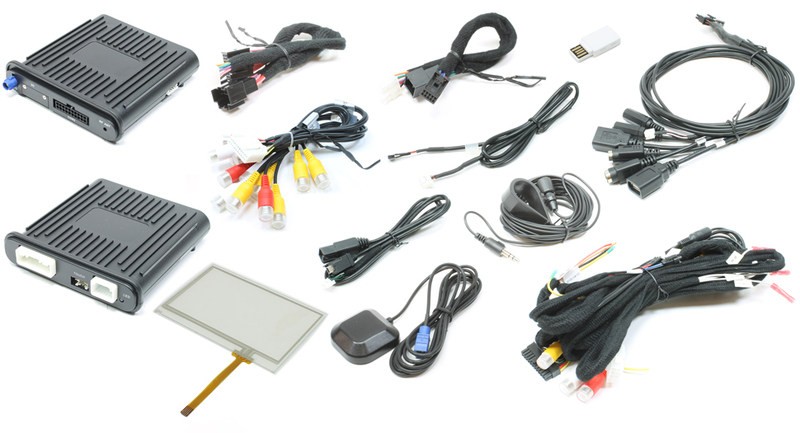 ** For use with vehicles equipped with 4.2" or 8" LCD screens. MyLink or IntelliLink systems required for operation. Not for use with vehicles equipped with factory rear-seat entertainment systems or vehicles that are pre-wired for rear-seat entertainment systems with Blue-ray player and motorized screen. Please note, SoftTouch™ Navigation Systems by Rostra are only sold through authorized distributors. Please contact Rostra to locate a distributor in your area for your Chevrolet, GMC, or Buick add-on navigation system.